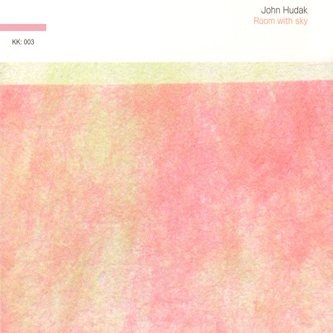 **Now available in Flac in format** When listening to this sixty minute piece from veteran experimental sound-artist John Hudak it's hard to believe the way it was created. 'Room With Sky' was forged one day in New York, the room it was recorded in was flooded with sunlight thanks to two large windows and Hudak proceeded to record himself speaking in a stream of consciousness style. He took this recording and went on to process it until the words themselves were gone entirely, leaving only the skeleton of speech, leaving what can only be recognised as haunting, dripping tones. You could say this 'repeats' throughout the duration of the track, but there is little room for repetition in Hudak's work, he references the sound of crickets for instance in the way it sounds similar, but it's not the same and the more you listen the more you realise just how varied the sound is. Like all good minimal music too, 'Room With Sky' is only minimal because of people's pre-conceptions of what 'music' should do, and this is a rich, beautiful and involving a recording as you could hope for. It's another great addition to a superb catalogue from Plop, sitting very comfortably next to Taylor Deupree's 'January' and Richard Chartier & William Basinski's untitled collaborative album. Gorgeous and understated bliss.